Ships partially assembled Folding platform truck features 1" tubular steel handles. PVC Surround Bumper helps protect walls and furniture. Handle folds down for easy storage. Load Capacity - 660 lbs. The folding handle platform cart has been in much demand since it arrived and has made our lives much easier and more efficient. Many thanks! Our church purchased the folding handle platform cart to keep our handbells on. This cart is stored in the music equipment area along with other items music stands etc. This cart was chosen because of it's sturdy construction as the bells are quite heavy in their cases. It truly fits our needs and will serve us for many years. Since it's purchase it has proven it's value many times. I take my product to events, bazaars and markets and the purchase of this platform cart has totally simplified moving my product and display items. It handles with great ease and I particularly appreciate the rubber gasket around the edge of the platform when steering in and out of difficult spaces. Once folded up it is a tad heavy for me to lift in and out of a vehicle, but I do really like its sturdiness. The handle on this hand truck is higher than our old hand truck. It is easier to push because of the higher handle. The cart was easy to assemble and worked fine in tight places. the only suggestion I have is to add some type of Dring to attach the bungee cords to. I have already recommended this to another vendor and they will, most likely, purchase your cart. We move a lot of music equipment and have for years. I was thrilled to find Hand Trucks R Us. The variety and price were outstanding and the service was first rate. All was on time and on budget can't ask for more. I HIGHLY recommend them. Cart is well constructed, easy to use and handle. We use at home to transport, relocate heavy items and I use it to carry supplies from the car to the classroom or other venues. I should have gotten the smaller size for my needs but the larger one has come in handy for home use. Great cart. We use these carts to carry 400lbs of tool cases and luggage when we travel onsite. This is about the 4th cart we've purchased in the last 5 years. This version, of these carts, was the best built out of all our previous ones. The handle was taller and therefore, easier to push/pull with. It also had a very nice folding/locking mechanism. The only issue i have with this cart is that the casters have a lot of slop in the bearings and one wheel has a thump when it rolls like it has debris in the bearing. Still works well, just annoying. This folding cart is absolutely what we needed! My wife does craft shows and this is perfect for bringing along on the trips. It takes up very little room in the van yet is incredible strong and sturdy. No problems whatsoever we should have bought this years ago. Great price, great product, and very timely delivery. The hand cart that I purchased is perfect for the purpose of transporting books from the basement in the library to our book sale room on the upper level. What used to be a tedious task is now a piece of cake. This product is sturdy and easy to use. The casters roll just fine. Built tough, great for lugging our heavy amplifiers around, which we do every other day. Excellent product. Would recommend without reservation to homeowners or small business owners. We recently renovated our home and used to move cartons and small pieces of furniture throughout the house. Also purchased this same product over 18 years ago while working in a small office which I staffed alone at times or had one assistant. It was used for transporting items while conducting training sessions offsite simplified moving cartons of training materials and av equipment, etc. 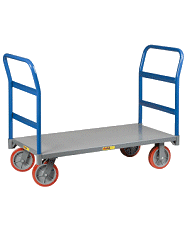 Great platform truck available in two sizes. Great price. Free shipping. Thanks, Hand Trucks 'R' Us! Works great and easier than my old cart. Holds more and transport easier. We purchased this for my elderly mother. She already owned such a cart and had owned it for years. The old one was rusting and falling apart and she really needed a replacement. This was the exact same cart, only a better quality. She uses it to take her trash can to the curb. Just perfect. This cart makes hauling anything a breeze. It's easy to manuever and easy to put away. A must have for any homeowner. We used this cart to take things back and forth to trade shows. It was GREAT!!!! Very lightweight and easy to fold up for the car. This is the perfect one finally! I love my new platform cart. For 8 years I have been a book rep, carting books to conferences. I have bought and broken, worn out or discardedmany hand trucks over the years. But this one is fantastic. It is easy to manuever, folds up in a second, carries a huge load. The wheels are strong. Now I use it all the time, lend it to friends and family who are moving or needing to transport lots of boxes. No problem with the delivery of the hand truck. I would recommend this company as well as the product. This is a great product and allows me to be able to cart my sculptures around rather than have to carry each box of them when I set up at art shows. I am so glad I found this website! This is a very practical product for anyone who doesn't like to carry lots of stuff back and forth! A pleasure to deal with you. The folding hand truck is perfect for my needs. It is very well made and very simple to asemble. 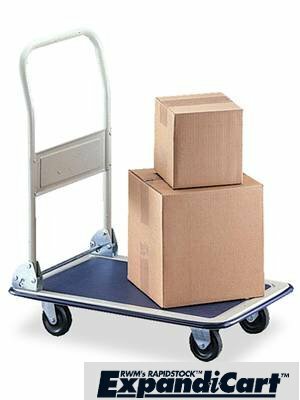 Great handtruck....it carries all our musical equipment with no problems. We love the heavy construction and plan on getting much use from it. Thanks. The cart is performing well for us. We have had some delamination of the gippy top and I am not not sure how long that will last, and I do wish it was just a little bit bigger... like the size of a flatbed cart you use at Home Depote or Lows... but it does the jobs well enough and folds up for easy storage. Just couldn't find anything as big as I wanted. Initially sent a damaged cart, I contacted customer service who promptly sent another. The cart is sturdy, well able to handle a variety of jobs and easy to move. I bought this cart to help our daughter a sophomore move into her dorm. In her freshman year this was a nightmare, but this year she was able to manage all the journeys back and forth to the car easily without too many trips.As she goes to school in Florida the ease with which we were able to do this meant that the move in took approximately half the time. Many parents were very envious of the cart and we let a few use it and told them where we purchased it. Thank you for such a great product. It paid for itself in our time and effort on this trip and will in years to come. I am presently using it to haul water to the stadium for our school football team and marching band. Excellent for this Product and Free Shipping service Thank you so much will recommend to my friends. This is great time saver as I load and transport products from my vehicle to my vending machine location. the truck is excellent i use it for dog shows to carry all my kennels and chairs etc. I love my handcart. I am an author and use it to caddy books. Thanks so much.